Netbooks. They are everywhere. Even at Toys R Us, as you can see by the image to the right of this article. I’ve been aware of them on display at Toys R Us for a year or two, but I’m surprised to see them still sold there. In a way, it makes perfect sense though – netbooks are probably the best bet for buying kids their own computer, although I’m sure they’d argue in favor of an Apple iPad. 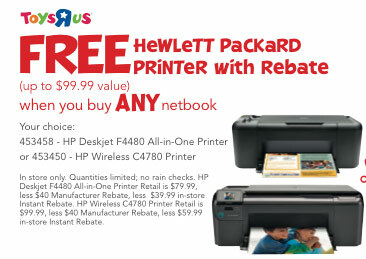 While the ad to the right for a free printer only applies to in-store purchases up through tomorrow afternoon I believe, Toys R Us actually has a fairly comprehensive netbook section on their website, including a video demonstrating the differences between a netbook and a regular laptop or notebook. Online, they sell everything from Sylvania 7-inch netbooks with a VIA 8505 Processor up through 10-inch HP Mini 210 running the latest Intel Atom CPUs, alongside the Toshiba NB305. Yes, that Eee PC 900 maybe the original, since the model # is EEEPC900BK091X, but they are carrying some of the latest netbooks. This entry was posted in ASUS, HP, Intel Atom, Netbook, Sales and Deals and tagged ASUS, Atom, EeePC, HP, Netbook, Sylvania. Bookmark the permalink.